When a child gets sent home from school with a lice infestation, it can make for a really rough day. While lice is not a seriously life-threatening problem, it still needs immediate treatment, especially to send the child back to school. Sometimes a child must be treated even if just a person in the child’s class has lice. Parents may feel embarrassed, or may not know where to turn for treatment. Here at The Lice Place, we offer several different treatment options, including a line of lice removal products in Springfield. We have been in business for many years, and are experts when it comes to ridding clients of lice and their eggs. We sell products both online in our Web store and in all of our physical locations. Products such as shampoos, conditioners, mousses, and combs get rid of harmful lice and their eggs and keep them from returning. We also sell lice repellent spray as well as complete lice removal kits. It may be a good idea to speak with a member of our staff prior to purchase, as many of our products are geared toward different levels of infestation. Everything that we sell and use here in our clinics is safe, non-toxic and environmentally friendly, and can be used on or near kids, pets, and adults. Our products are also backed by a 100 percent guarantee that they will work. For those who do not want to give treatment at home, we also offer lice removal in all of our clinics. Allow a trained professional to get rid of lice for you, effectively and easily in our clinic. 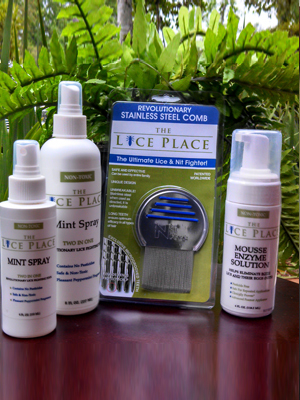 To learn more about our lice removal products in Springfield, or to make an appointment, please call The Lice Place at (615)656-1646 to speak with a member of our staff.